The KONG Zillowz are your dog's new toy friends. The cheerful box-shaped toys are filled with crinkly paper and a squeaker for even more entertainment. Available in four variants: squirrel, frog, dog and hedgehog. Playing is more than a fun thing to do. It also ensures your pet moves more, relaxes and helps you to bond with your dog. The Zillowz from KONG are highly suitable for entertaining your dog. 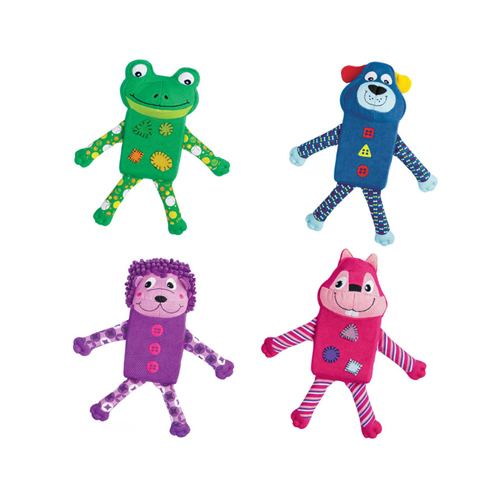 The box-shaped toys are made from different textures, contain crinkly paper and a squeaker. All this makes the toys even more attractive for your dog. The KONG Zillowz are available in two sizes: Small and Large. Have you used KONG Zillowz before? Let us know what you think about this product.